Harihar Infrastructure Development Corporation(HIDC) Ltd. (Formerly Harihar Housing Agency) is an ISO 9001:2008 certified real estate Company established in 1993 and based at Nagpur, India. The Company is managed by professionals in with decades of experience in the real estate industry. We have over 1000 satisfied customers. 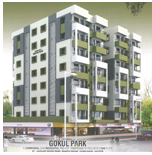 The Company has developed several real estate properties comprising over a million square feet, in and around Nagpur including bungalows, apartments, commercial space and townships. Easy housing loans are available to customers on all our projects. Below are a few of our successful projects.